Tasha Williams is a slightly wacky, cat loving, novel writing book hoarder, who is in her third year of a Creative Writing degree at Edge Hill University. She wrote her first novel in 2012 'Short Encounters' and is currently editing it whilst preparing for NaNo 2013 with her second novel 'Turning the Page.' She writes for a number of genres and ages including YA, Fantasy, Chick Lit and Childrens. Her two short stories, Whimsical Kettle and Whisk it, Cellmate are published on Amazon Kindle, with a longly awaited Christmas special and the third in the trilogy being released between November 2013 - April 2014. In her spare time, she plays a ridiculous amount of Pokemon, lives off coffee and reads religiously. Becky Hayes is a moderately wacky, guinea-pig loving student. 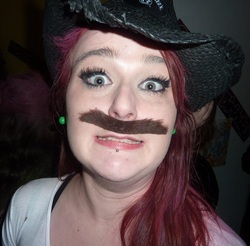 She is currently studying her third year of Creative Writing at Edge Hill University. Most of her current interests in writing lie in poetry and fiction. She has always been interested in writing short and novel-length stories relating to the genres of Fantasy, Adventure and Science-Fiction. She loves the idea of creating brand new worlds out of pure imagination. As well as writing she also has a passion for drawing; both traditional and digital work (slideshow to the left.) She is the keeper of Photoshop and the main designer of the magazine's decorative work. 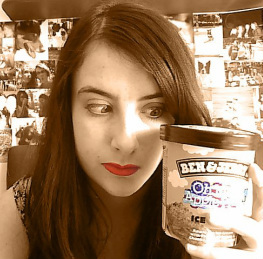 In her spare time she stresses about general life, loses herself in books and has an unhealthy obsession with the two men in her life; Ben & Jerry.